Happy Bloggers Challenge Friday! This week, we're doing a little Tree Trimming, as I challenged the BC Players to an Ornament Theme. We don't have our tree up just yet, I'm planning on putting it up this weekend. Do you have any Christmas Traditions? I buy the boys ornaments each year for their stockings, then write their names and dates on them - it's fun to look back years past. My plan is to give them their ornaments when they move out, so they have something to decorate their tree with. I found these pretty ornament frames at Hobby Lobby, they are meant for photos, but I added stamped/die cut images instead. Looking for more Trim the Tree inspiration, click on the Bloggers Challenge Logo on my sidebar to see what the other players created this week. Be sure to stop back later for the ScrapMart Blog Hop! What a beautiful Christmas ornament, Lisa. Very elegant!! Your ornament is beautiful! I love the contrast of the silver frame with the bright red cardinal! Beautiful! Funny that we were on the same wave length! 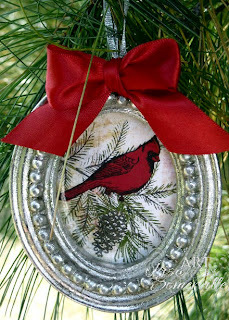 I too used one of these picture ornaments and almost used my cardinal but the one I wanted to use did not fit. I love the ribbon on this. I am thinking of going to buy a bunch more and making them as tags on Christmas gifts, so fast and easy! How sweet, luv the cardinal in the pretty ornament! I do the same with Ornaments every year...well, not in the stocking, but each year I buy him one that is something he was Really into that year and write the date on the bottom...so fun to look back and see what he loved each year. This is really beautiful. 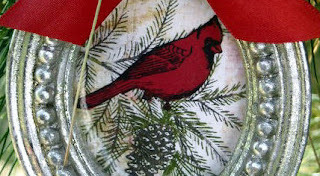 I love the red cardinal - so sweet and wintery. Our family has a christmas tradition of giving back. We allocate some of our christmas gift money to buy something from the World Vision catalog. You can buy a goat or a soccer ball or a well for a third world community. When we return from church service on christmas eve we eat christmas cookies and we all decide which items to donate from the catalog. Your ornament is beautiful. That's a fantastic tradition. I buy my girls and grand kids Christmas eve pajamas. It's not that memorable, but they always look good for Christmas morning pictures. Great ornament, never thought to use some of those photo ornaments for that. Looks gorgeous. We have the same tradition here with the ornaments, our tree almost falls over at times with some heavy ones. Scott & I both got all our ornaments when we moved out too so we'll carry on. Gorgeous ornament Lisa, I did the same thing an ornament for my son every year. A great way to start out. What a beautiful keepsake tradition! Lovely ornament too! Your ornament is lovely! I always love the look of a red cardinal at Christmas... I am sure your kids will be thrilled when they are older that you had such a wonderful tradition. I am sure that many stories will be shared when they hang their ornament with their families! So very elegant! Love the frame as it makes your beautiful coloring really pop! Lisa this is gorgeous! What a wonderful tradition. We have done the same thing for Greta and now with Coleen. Love the little frame idea....hadn't thought of that and will look for some for next year's ornaments! GREAT ornament! We do the same thing in our home....one ornament for each child and one for us (hubby & I). Now that my son is married, he'll be getting his boxfull..and it is FULL! We're actually running out of room on the tree for all the ornaments....but it is so much fun to look at each of them as we trim the tree! Each one brings back so many memories.